The subject of Classics is all about Ancient Rome and Greece. It encompasses the study of Ancient Roman and Greek societies as well as their culture, art, language and religion. People believed in many Gods in Classical times, and there was indeed some overlap between these two ancient societies. Not all Roman Gods were also Greek Gods but both of these ancient civilisations worshipped Apollo. He was seen as the God of many things, including: the sun, light, music and poetry. In this Novomatic slot, the Apollo it celebrates is the ancient Greek God, not the Roman one. This is evident in the style of the fonts and also the other symbols, such as the ancient Greek lyre! Not to mention the Greek architecture surrounding this slot game. The classical architecture is spot on. The mathematically-shaped buildings and the tall, straight columns make this slot feel even more epic. In fact, the background of the slot is so well-designed, it looks as though it could be a painting! 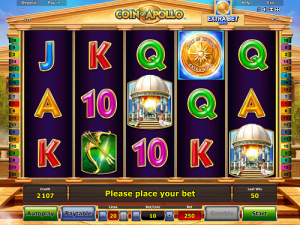 Coin of Apollo is a five-reel video slot with 20 paylines. There are plenty of special symbols and special features in this Novomatic slot, including an ‘Extra Bet’ option and Free Games. Novomatic loves ancient Greece and there are several other slots in their collection that are based on this classical theme. These other slots include: Mighty Trident, Apollo God of the Sun, Haul of Hades and Lord of the Ocean. Although the ancient Greeks didn’t play with playing cards, these are still a big part of casino culture and slot machines! That’s why these symbols come up time and time again on slot machines. They are normally the symbols that give out the smallest payouts. The same is the case in Coin of Apollo. 10, Jack, Queen, King and Ace are the values that are on these reels. More valuable symbols are much more elaborate! There are: the golden lyre, the golden bow and arrow, the observatory and Apollo riding a chariot pulled by four beautiful, white horses. Payouts are given for x2 or more matches for the high-paying symbols and for x3 or more matches for the low-paying symbols (the playing cards). You have the option to have up to 20 paylines active in this slot, but of course you can play to your preference. Paylines are quite standard in that they pay from left to right. Symbols that match up must fall on adjacent reels, on an active payline, to give the payout. Payouts are displayed on the paytable, which you can open whenever you don’t have the game in autoplay. Increase or decrease your bet per line to suit your budget. The paytable will automatically update the payout figures to synchronise with your bet. There is one special symbol that’s always active, and that’s the Bonus symbol! This is an ancient Greek scroll symbol, bursting with light! This symbol is able to stand in for any other symbol (like a Wild symbol) as well as giving its own payouts and triggering the Free Games (like a Scatter symbol, from x3 or more matches). It gives 10 Free Games at a time and these come with a feature – the Special Expanding Feature! This feature is quite common in Novomatic’s newer slots. Before the Free Games begin, one symbol will be chosen as the special one. Throughout the Free Games, the chosen symbol has the ability to expand and fill entire reels. The wins you can get from this feature are huge, especially if a high-paying symbol is chosen for the games. There’s one other symbol on the reels, which isn’t always active. This can be added to the reels when you activate the ‘Extra Bet’ feature. The Extra Bet feature multiplies your bet by 25% (so if you’re betting 1, your bet will increase to 1.25 when this feature is activated). This Extra Bet feature changes the Coin of Apollo into gold and adds this symbol to the reels! The golden Coin of Apollo is a great symbol to have on the reels as it can substitute for any of the other symbols – even the Bonus symbol. Therefore, it can help you get wins as well as Free Games. Is it worth increasing your bet by 25% to have this symbol on the reels? Only you will be able to tell by trying it out. Overall, this video slot from Novomatic has an RTP of 95.19%.